I wanted to try making another porridge bread from Tartine Book Nº3 - so this is a try at making the Rye Porridge bread, retarding warmer, and baking hotter, than the previous bake. I am posting this one, even though it didn’t turn out as well as I hoped, crumb-wise…but the flavor is absolutely outstanding, and I’m pretty excited about that! I’m excited too about this morning’s sunshine and a rare opportunity in my house, to take a picture of the bread with some natural daylight! The dough temperature was 79F and was bulk fermented at 80F, for 4-1/2 hours. (wanting to try baking smaller versions to see how it might work out). The dough was retarded at 48F for about 7 hours (warmer than my normal fridge temperature). I chose this temperature after reading about the Slow Final Proof method in Advanced Bread and Pastry (50F was recommended; I tried to play it safe by a couple of degrees, as per the book, the dough using this method “should be a bit stiffer”; this dough definitely was not!). 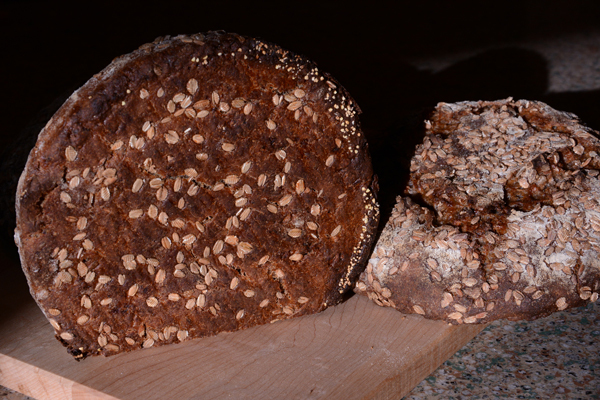 After retarding, the smaller loaves seemed overproofed, the large loaf maybe just on the verge of; these loaves did not have the airiness of the Oat Porridge loaves, at the same stage. 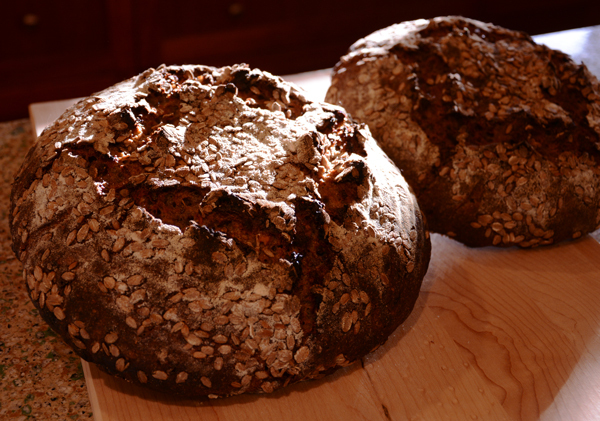 One of the small loaves was baked first, warming at room temperature for 30 minutes while the Dutch oven preheated. The warm up did not help this dough – but I did it anyway, wanting to see what the effect might be, after retarding at 48F. For this first bake, I also tried placing a stainless steel cake ring inside the Dutch oven (narrower diameter), hoping the narrower diameter ring would ‘fit’ better with the smaller loaf, and help it rise up better, having closer ‘support’ on the sides. This did not work out that well – perhaps I should have preheated the cake ring too – I think it could have been a somewhat of a barrier to the initial heat? If I try this again, I may try with an aluminum cheesecake ring or something non-stainless, and preheat it. The second, and third loaves, were baked hotter, working my way up to 50F hotter by the third bake. The third bake was the full-size loaf, and it was baked at 550F for 20 minutes, 500F for 10 minutes, lid off, then 500F for 15 minutes; the crust color is approaching what I was hoping for. There is sweetness from the wheat germ and walnuts, and a lovely tang and aftertaste, the rye porridge and fermentation adding beautiful flavors, and another very moist crumb, from the porridge. I think this bread is going to be an excellent keeper! 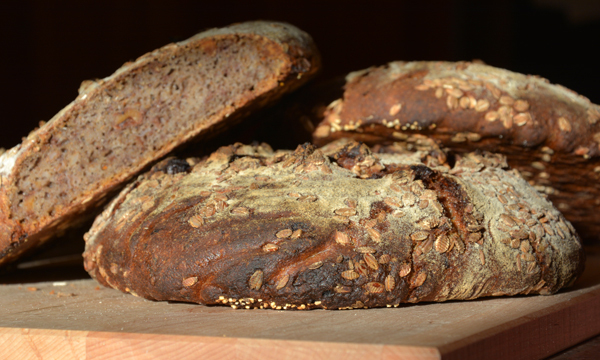 …and the pattern of rye flakes on the bottom, contrasting nicely with the crust’s rich caramel color! while I try to find the retarding temperature and timing that’s just right. I was just browsing and ran across your bake. Went to my book #3 to check out his formula and to compare it to cracked grain/porridge bread that I bake often to see what you were working off of. I guess my results are different because I use freshly milled whole grains for all the grain in the dough. First difference is that the amount of grain I use, after being cooked so water weight is included, is 67% of the total flour weight. I also use more leaven than he does - 26% which includes both water and flour (15% total flour/ 10% total water). I use YW to feed my leavens so maybe that is why I get a taller profile. My method is different too. I use txfarmer's method on about all the loaves I bake which means - 2 leaven builds during the day; final dough mixed in the evening followed by bulk ferment in the refrig. overnight; warm up time in the morning then shaped and proofed. This means my dough has a lot more wee beasties in it than his does due to long wet time so maybe that is why I get a taller loaf? My overall HL is 100% which includes all liquid in the entire formula……again - I am using 100% whole grains and they are thirstier…. The bread I bake is one requested a lot by people due to flavor etc. so it is a 'keeper' in my files. It is a good base and enrichments can be added as txfarmer does with her Oatmeal Sandwich loaf so once you get his loaf down to where you want it - the combinations are endless :) Just what you need, eh! Thanks for sharing what is happening in your kitchen. 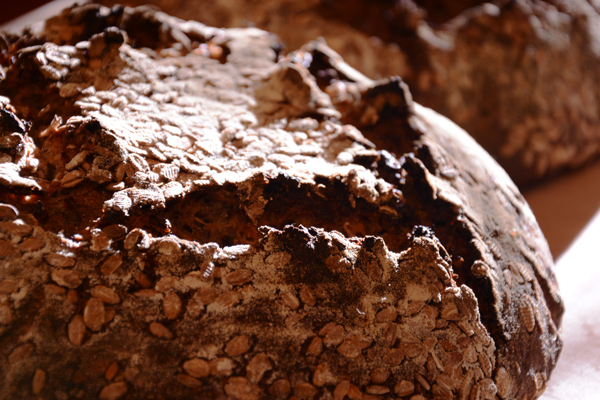 Thank you for your comments - it's interesting to read about how you make your cracked grain/porridge bread. Interesting too that you've mentioned wet time - that was something I was going to mention in the post. The flour had an extended autolyse (5 hours, intending 4), a 4-1/2 hour bulk, 1/2 hour rest after preshaping, and 7-9 hours retarding (depending on when the loaves were baked), so approximately 12-14 hours with the levain in contact with the flour. I have found fermentation and fermentation tolerance in the dough to be a challenge with Tartine bread doughs. WIth this new book, my interest is renewed, to try and better understand the relationship between the amount of flour pre-fermented, mixing, and fermentation times and temperatures, in an effort to manage the fermentation variables. Mr. Robertson made reference to "making water stand up" in his book - that made me laugh, and it sure would be nice if, eventually, that might happen in a Tartine loaf I'm making! I'd like to get a solid understanding of how to make successful bread with his methods, and it will be very enjoyable branching out from there (I really like your yeast water idea!). I hope you really love whichever cookie you make next; I've got my eye on one, too. Sounds like wet times are similar. One thing I do to keep fermenting in check is to only give the final dough 1-2 hours of room time bulk fermenting prior to refrigeration. Some doughs get none - usually lean loaves. I find enrichments slow the yeast down so my enriched loaves do get a bit of room time before the refrig. I look for about 25% rise in a dough then I know it is time since it will continue to ferment in the refrig. If I have an unusually active dough….I will do a few S&F during the refrig. bulk time too to balance out temp. of the dough. Your 4 hour room temp. time sounds long so maybe that is where the over fermenting piece is coming in???? Not sure what your room temp. is but in my house it is between 65-70° this time of year. I know Chad has control of temp. throughout his process and that does have a significant impact on how fermentation happens - as I know you know….and I know you know it is hard to duplicate that in a home environment…. Thanks for letting me know what's working for your doughs - I am grateful for your experience. In this book, Chad recommends keeping the dough at 80-85F for 3 to 4 hours during the bulk fermentation (to promote active fermentation & strengthen wet dough). I tried to stick to that, with dough temperature of 79F at the start of bulk fermentation, and keeping the temperature inside my Brod & Taylor proofer at 80F throughout this time (I let it go an extra half hour, as time was spent mixing in the rye porridge, walnuts and oil (trying to do this slowly, to be gentle on the dough) - perhaps that extra time was not a good decision). One disadvantage in the setup I have here - the only container I have that really lets me see how much the dough is increasing in volume during bulk fermentation is a square cube of a Cambro and I find it awkward for folding dough. So I bulk fermented the dough in a bowl that fits inside the B&T - the bowl allows me to be more gentle when folding the dough, but it's difficult to judge how much the dough is expanding (I let the dough bulk ferment the maximum time maybe I didn't really need to?). I've been messaging with someone just now and we were talking about making 1/2 batches - I'm going to start doing that with future bakes from this book - it would be nice if the dough could ferment in a rectangular container, that fits inside the B&T. I find the rectangular-shaped containers much easier to fold dough in, and I can keep a better eye on dough expansion. I will try to figure out what is the best temperature for overnight proofing, in my kitchen here - it will be trial and error but with the way these breads are tasting, I'm happy to keep baking them! As Karin always says 'taste rules' so if your bread is tasting good….but I know how it is when I want to get a recipe 'right'….. I don't use a specific bowl to check expansion. I go by the feel of the dough. After an hour I do a S&F and that lets me see how the dough is developing. There have been doughs that I have had to let sit out all night due to sluggish fermentation due to high amounts of butter in the dough….so all things get adjusted and some year I may have things all figured out….hahahah. That will be the day because I know there will always be something to come along to challenge me. P.S. Which cookie recipe are you eyeing? I have the Pecan Shortbread tabbed - not really a cookie but something about it is calling me…..but I have an oatmeal recipe out of King Arthur's Cookie Companion ahead of it so who knows when I will really do try it out. There were two cookies, actually, the almond ones (with the Jamaica flowers), and the piloncillo rocher cookies. And some pretty special rye cookies are now on my radar screen, too! write up. It is a rye bread that has 50% Bread Flour and 50% Whole Wheat? So how much rye is in it? Or am I reading it wrong? 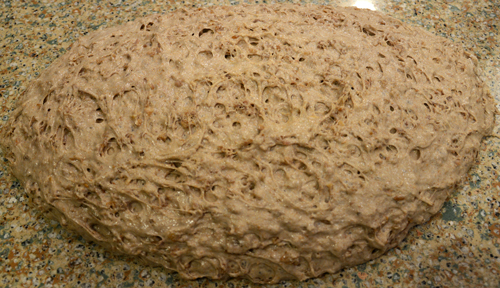 The dough looks like it is a wet ,sticky at least 50% rye and the rest whole grain? Wet rye like to spread out at any temperature over 36 F it seems - if it doesn't spread before it hits the heat... it will for sure afterwards. This bread is formulated similarly to the Oat Porridge bread in my last post - 50% bread flour, 50% whole wheat flour, and 50% cooked rye porridge added in (I amended the description of this bread to read "50% rye porridge" instead of just "rye porridge" - sorry for the confusion!). I'm so happy you liked the rustic look of these loaves; the purple color, too. The flavor of this one is exceptional. I hope you enjoy baking from this book, and thank you for your comment! OK now I get it! This is the 2md bread from this book that really caught my eye! Whole grain baking hasn't been the same since PR's book and now this one will take it to another level. What a beautiful looking loaf! I can't wait to order my copy of this book so I can try some of these formulas. I can almost taste how good it must be with your beautiful post above. So is this supposed to be this flat of a profile or was that due to the over-proof you mentioned? Thanks for posting your bakes from this excellent book. Wouldn't it be nice if the author actually commented on one of your posts....we know he visits the site per your last post...so you never know :). The purple color of the crumb was a bonus. Looking at the pictures in the book, there are not many of the crumb but the ones that are there, are gorgeous - light and airy interiors. It's hard to tell how much the loaves have risen, but there is definitely oven spring when you see pictures of the baked loaves. I tucked these into 48F refrigeration last night before bed, and was nervous, wondering would happen to the dough proofing at that temperature, and what I might find in the morning. Sure enough, these loaves were too far gone when I went to bake them. Should have set the alarm clock earlier, to check on them sooner! And thanks to Janet, I'm re-thinking what I did during bulk fermentation - it may have been a tad long, too. If Mr. Robertson commented here, that would be a sincere honor! I wonder if he ever comments on France's blog at Tartine Bread Experiment? That lady is dedicated...and she's got baking Chad's breads down pat! I really hope you enjoy making the formulas from this book! I don't have this book yet, but I can see from your post that the formula lands you in very complex terrain. I think being able to produce the "porridge" exactly the same each time will be hard to achieve, but a key element in the process. And it is always going to make a sticky dough isn't it? The flavours sound amazing. 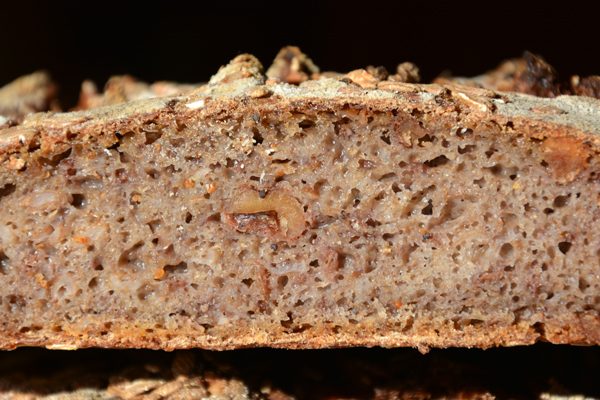 I really want to have a walnut bread in my product range, but cannot find a way to make such a loaf commercially viable. Walnuts are £10/kg in the UK, and that beautiful walnut oil you mention...I daren't tell you all how much that costs over here! I suspect from the title that the new Tartine book has a focus which is of great interest to many of us, but one which is quite difficult to get exactly right. So, plenty to get the teeth into then! "Everything about our process is taken to the point where, if one thing is slightly off, it doesn't really work." For the porridge, these rye flakes were quite a bit thirstier than the oats and I had to add more water when cooking. Not sure if it was that bit of extra water, or just the fact that it was rye porridge this time - but this dough was stickier than the oat porridge dough; sticky enough to make shaping difficult. I appreciate the cost of ingredients and am grateful for the luxury of the walnut oil, and these walnuts. The walnuts are harvested locally from a tree in someone's yard and sold at the market...I don't know what kind of walnut they are, but they have a sweetness like I've never tasted and it may be because of the freshness. I enjoyed some of this bread today at lunch, just on its own - fabulous - and gives me encouragement to persevere. Thanks so much for your encouragement too, Andy! Looks like a delicious bread, Breadsong. Inspiring too! Thanks Khalid! - this is a really good one, imho. 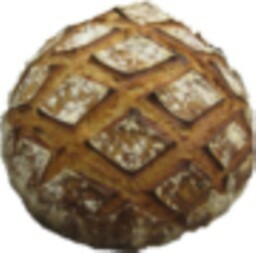 Another great post, breadsong. 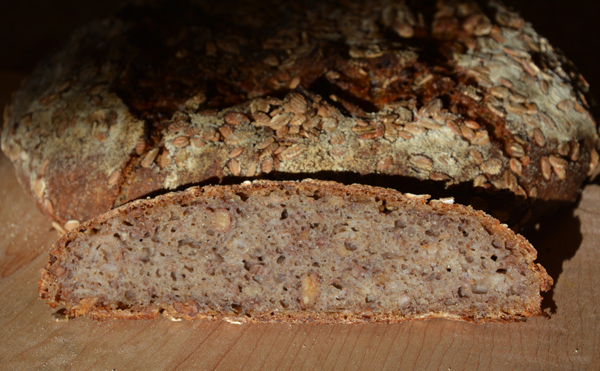 My first crack at the double fermented oat bread turned out very similar to your rye porridge bread. Your dough photo is great - almost gives me chills thinking about how sticky that is! Do you think a few more folds might be worth a try? That's the direction I'm leaning in, along with maybe a slight reduction in water until I get the hang of these breads. I thought I was pretty good with wet doughs, but these are going to take some practice! Based on the way my loaf tastes and the way your loaves look I think it's going to be worth the effort. Thank you! - I am glad to know you liked the flavor of the double fermented oats - did you use the yogurt or levain method to ferment them? This dough was really soft, but did eventually stretch a gluten window so I thought I got it to the point where it would be OK. I wonder if the flour was wet a little too long, prior to mixing in the levain (protease getting underway?). I haven't had a lot of opportunity to bake with the local whole-wheat flour I'm using; I wonder too if I'm pushing the limits of the fermentation tolerance for this flour. I agree with you, I do think it's going to be worth it to keep working at it. Thanks so much, Marcus - best wishes for your next bake and hope it goes just the way you want it to. I just used a bit of levain to get the oats fermenting. I left them out overnight and they certainly did ferment - very tangy. The sour carried over into the bread, so if a very mild loaf is the goal I would be cautious with this approach. I'm looking forward to trying out the barley porridge - flax bread next chance I get! I hope you'll let us know how it goes with the barley porridge bread!